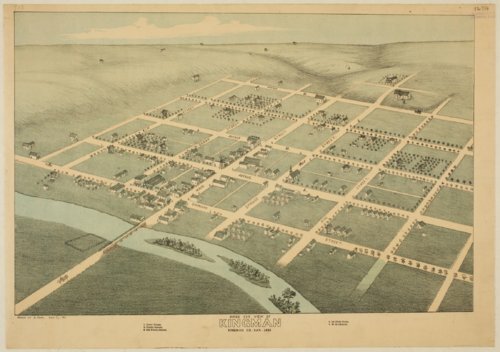 This colored bird's eye view of Kingman, Kansas, was drawn by Augustus Koch of Kansas City, Missouri. It shows the court house, two schools, a hotel, and the Methodist Episcopal Church. The street names are on the image and the location of the business district is very obvious. Individual houses are also visible. There is a windmill at the corner of Main and Avenue A. The south fork of the Ninnescah River runs through Kingman.